What can I become with what I have? This is the question that keeps me rolling since the very moment my eyes opened to the world of -- hardships, struggle, short-comings, pain, rejections, disrespect and humilation. Everyone has their story to tell, their story to sugar coat, their story to mask, their story to embrace. Every time I look back and see myself in the mirror, I can't hide the fact that I still feel the "impostor syndrome". 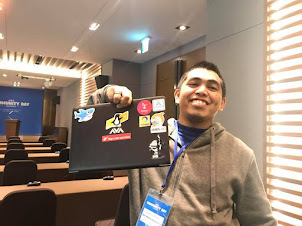 Almost 9 years in the IT Industry; 2 years of call center experience, 4 years of system administration and 3 years of devops -- sums up my skill sets. While on the other hand, 25 years of hustling; 3 years of staying in an orphanage, 1 year of schooling (ended a dropout), 7+ years of learning the street language and 5 years of being a father -- sums up my attitude. No matter how you look at life, I say the proper way of looking it will always be moving forward. Which tells everyone that life doesn't care of what you are today and who you were way back, because by tomorrow it'll all be part of the past. Life is all about what you want to become and how bad you want it. People always appreciate you when they are (1) amazed, (2) thankful, (3) motivated, (4) inspired by your acts, your words or your ideas. I have no rights to tell you which is the path to greatness but I know how you could get started with your journey. I personally applied this myself, so if you see me as someone who is successful (which means it somehow works), then it should work for you too. Again, life is all about what you want to become and how bad you want it. On top of this, you should be aware that there's no such thing as "something for nothing". So you should be willing to sacrifice whatever it takes to achieve what you've been wanting. Excuses is a big "no no" but most of us loves to reason-out. Here's one scenario I hope will open your eyes to opportunities. The "→" represents me telling you what your option is. NOTE: If you can't use the company resources, ask someone to do a printout for you. Out of your friends, I am sure there's someone who can pledge for that. Resources for learning "programming" is already in the internet. Utmost of them are feel. It only requires you to invest one thing to learn programming and that's your "time". Einstein said "Logic gets you from A to Z, imagination gets you everywhere". As you start reading, there will be times that you see yourself lost rather than being enlighten. Well, that's normal! Because the things your reading is something you don't have any experience. Prepare all your theory, gather as many as you can because in the "application" state, that's where you test which one is right and from those correct theories which one is best. In the application state, that's where you ask people about your questions and doubts. Einstein said "If you cannot simply explain it, you don't understand it well". The test of knowledge will not be what you've read or what you've known. Acquiring the learning is just a half of knowledge, imparting it is the other. Well you might ask, why should I simplify what I know for others? It's for them to understand the "thing" the way you understand it. Verify your knowledge from those whom you teach. Einstein said "Don't be a man of success, be a man of value"
For what you've learn is yours, it's always good to empty your cup all the time. Give your learning to those who wanted it, invest in others so they will do the same. Learning is a continuous process and you'll never runout of topic in your lifetime. When Einstein was asked "How does it feel to be the smartest person alive?". He replied "Ask Nicola Tesla". Even the smartest will not claim that he is. Don't think your smart enough, don't think your good enough, don't think your tough enough. Life has so many aspect and there's always that "someone" who is better than you. I hope this gives you the fuel you need to jumpstart your career growth, personal development and goal-centric life for 2018. Be better each day, not by comparing yourself to others but who you were yesterday.